Background: In the recent years, polymeric nanofibers have gained lots of attention in the area of drug delivery applications. Owing to its simplicity, ease of composition method and high drug loading capacity, it provides various benefits for the therapeutic applications. Nanofibers are useful for the delivery of antibiotics, anticancer drugs, analgesic’s agents and various proteins for drug delivery applications. Electrospinning method is widely used method for the preparation of nanofibers, based on their feasibility background for scale-up process from laboratory to the industrial applications. Method: A literature review was conducted to summarize the reported articles as well as patents that have been granted and filed for work related to nanofibers in drug delivery. Efforts have been made to include various types of research undertaken by the researchers for the fabrication of nanofiber and its application in drug delivery system. Results: In this paper, a detailed information is reported about researches and developments related to electrospun polymer nanofibers including its fabrication process, structure, properties, characterization, applications, and patent. Amongst all the patents available, 18 most relevant granted patents and 14 filed patents was summarized in the review article. 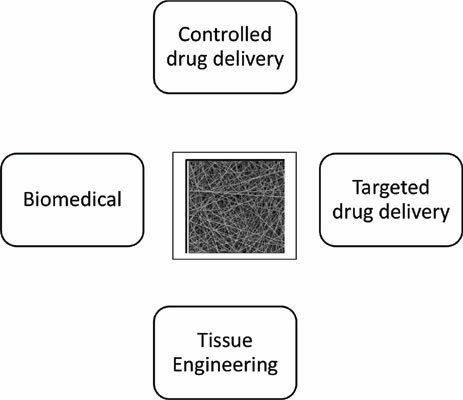 Conclusion: We expect that these fundamental applications of nanofibers could help the researchers to develop and gain knowledge about nanofibers in drug delivery application. Nanofiber, drug delivery, pharmaceutical applications, tissue engineering, chemotherapeutic agents, patents.